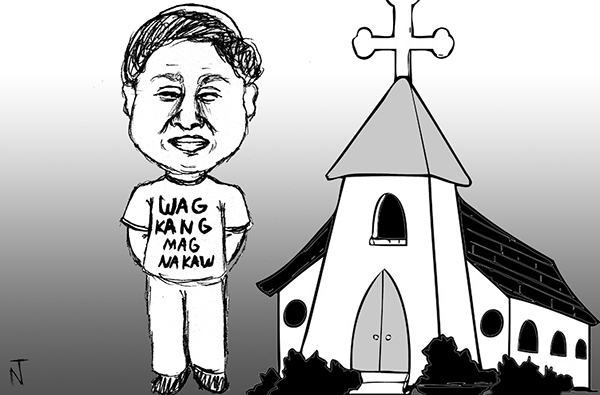 Manila Archbishop Luis Antonio Cardinal Tagle pushing the anti-corruption “Huwag kang magnakaw” campaign in “uprooting the culture of stealing on all levels of society and planting the seed of honesty, integrity and generosity so as to finally reclaim the stolen dignity of the Filipino people.” Image credit: N for the drawing and PT for the publication. With less than a year before the 2016 Presidential elections, I hope we will make the right choice of candidate. It’s exciting to watch presidential candidates here in the Philippines engage in debate with fellow candidates on national television. The voting public is learning from those discussions giving them the opportunity to choose the right person to vote. Even political chat forum can help the voters understand the stand of their presidential bet on particular issue. We’ll see who among the old and new faces in the political arena can bring “change” to what we have right now. I admire candidates who actively participate in debates to answer issues thrown at him by his or her rival and have a clear stand on timely issues/problems besetting the country in general. People should be aware that candidates who depend on political gimmickry to be popular or evade issues at some point are those you can’t truly trust or rely in times of emergency. What will become of us when we are faced with another natural or man-made calamity? How many presidential candidates have promised to uplift the living condition of the poor or provide job to the millions of people seeking a decent way to live? Most of them do at first glance. But how many were able to keep their promise? I hope dear readers that you’ll think several times about the candidates whose name you’ll write on the ballot form. They will shape our childrens’ future and the generation next to them. Do they deserve to be in power? We just hope that this coming election will be peaceful and clean. Vote wisely. This entry was posted in Personal thought and tagged 2016 presidential elections, election, huwag kang magnakaw campaign, make the right choice, vote wisely on May 14, 2015 by Yami.